Set on the owners' small sheep farm there are fantastic views here. 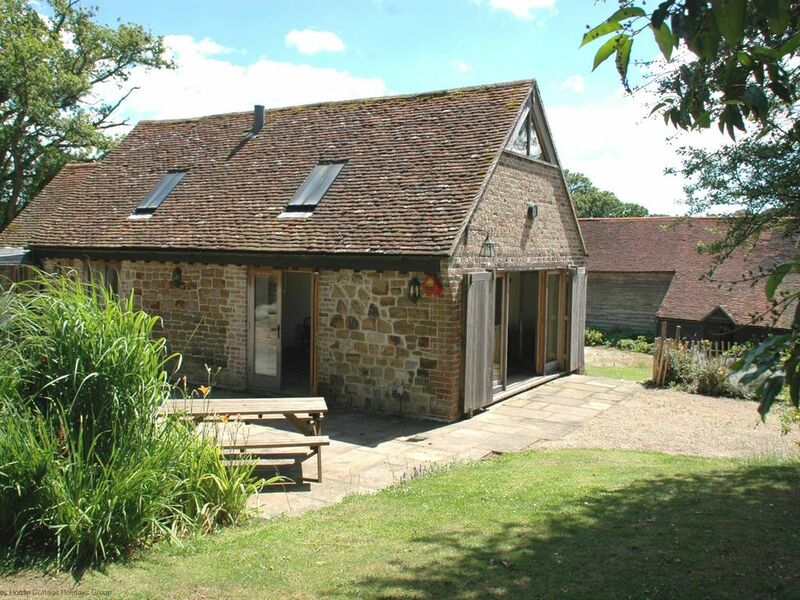 The cottage is also set on the Ouse Valley long distance path so perfect for keen walkers. This one bedroom cottage is all on the one level with a fine vaulted ceiling and great living space with doors opening onto the patio and beyond to the garden. There is a modern shaker style kitchen offset from the living room. The bedroom has a super king sized bed that can be configured as twin beds if required. The bathroom has a bath and separate shower cubicle. The whole property is heated by under floor heating. Right in the heart of mid Sussex, Cuckfield is a very picturesque town. Well located for exploring the county it is just a short distance north of Brighton and the South Downs at Devils Dyke. Sheffield Park Gardens, Wakehurst Place and the Bluebell Railway are also within a twenty minute drive along with the South o England Showground. Ideal for anyone who loves the countryside . We loved the peace and quiet. Cottage well equipped and comfortable, very good shower. Thank you for taking the time to review your recent stay at Quail Cottage, we are delighted to hear you enjoyed your stay and hopefully you will choose to stay with us again soon. We loved the simplicity of this beautiful cottage, which is brilliantly located for visiting so many wonderful gardens. During our stay we visited Nymans, Sussex Prairie Garden, Batemans, Sheffield Park Gardens and Great Comp Garden, as well as Charleston and the Royal Pavillion in Brighton - you will certainly not be short of things to do if you stay here! The cottage is set in wonderful countryside with many inviting walks possible right from your doorstep too. It was a terrible wrench to leave at the end of our stay, and we'd love to visit again to see the gardens in different seasons. Thank you for a wonderful stay! Thank you for taking the time to leave a review regarding your recent stay at Quail Cottage. Hopefully we will see you again soon! The cottage is comfortable and well-equipped and set in a lovely, quiet spot with lots of wildlife around to spot. The owners are friendly and helpful and provided a very good welcome pack (which included delicious homemade jam). We enjoyed our time at Quail Cottage very much. De cottage is prachtig en van alle gemakken voorzien ingericht. Veel aandacht besteed aan details. Vriendelijk ontvangen in persoon en met een welkomspakket. broodjes, jam, koffie en melk. Een zeer komplete keuken. De cottage stast midden in een landelijke, heuvelachtige en bosrijke omgeving. Prima uitganspunt voor wandelingen via de vele public footpath. om je heen houden. Yoen wij er waren in mei weinig reuring om je heen. Als je op zoek bent naar een comfortabel en rustig gelegen vakantieverblijf, is dit de perfecte locatie. Gelegen midden in de bossen en weilanden met overal rondscharrelende fazanten en eekhoorntjes, zit je hier midden in de natuur. De gastheer en -vrouw zijn heel vriendelijk en behulpzaam. Er zijn genoeg prachtige locaties in de buurt om te bezoeken, en zelfs een dagje Londen is goed te doen, aangezien de M23 in de buurt ligt en je met een uurtje in de stad bent.